If your facility’s concrete is damaged and causing trip hazards, you need to take action. These problems, however small, only worsen over time. While your first inclination may be to tear out and replace the whole surface, there may be a less invasive option for you, depending on the severity of the damage. With a sound concrete base, choose to restore. Your concrete surface may be pitted and worn, but if it has a structurally sound base, as most older concrete does, it’s likely we can help you avoid a replacement by repairing it. 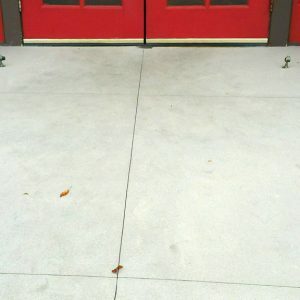 If image is important, we can resurface and seal the walkway with an epoxy-resin overlay, as well. Epoxy systems are twice to three times as strong as conventional concrete, so this is more than a stop-gap solution — it’s a long-term fix that spares you the hassle of replacing concrete. Epoxy repair saves you stress and expense. Concrete replacement jobs can shut down pedestrian traffic for at least three days, and jobs on vehicle traffic surfaces are a minimum of seven days. If that’s not bad enough, brace for clanging jackhammers, dump trucks and backhoes on site. Repairing/restoring with epoxy is not only an easier option, but it can also be a less expensive plan. Jobs take less time to complete, and shutdowns are greatly minimized. Don't just jump to a concrete replacement. Our experts will determine if your concrete is a candidate for repair and/or restoration.